LiveU's Solo live streaming video encoder adopted by Global Sports Streaming. Hackensack, NJ, April 2016 — As boxing legend Manny Pacquiao heads to the 66th and final fight of an illustrious career, Team Pacquiao is partnering with Global Sports Streaming (GSS) to bring his dedicated fans a front-row look at his training camp regimen and pre-fight activities through a series of livestreams to Pacquiao’s YouTube Channel. GSS has selected LiveU’s new Solo ‘plug and play’ live streaming bonding solution to connect automatically to YouTube Live. Team Pacquiao is using its social media network to drive the fighter’s more than 12 million fans to his YouTube Channel. GSS Producer/Director and Founder Armando Bareno II explained that, “Manny has established a brand that goes well beyond boxing and wants to maintain and grow his fan base for his final fight and future endeavors, which include a political career. Live streaming Manny's workouts is the best way to connect with his fans and grow his channel quickly, while bringing added attention to the upcoming fight in a unique way. 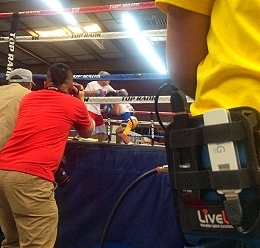 Using cell phones, along with prosumer and professional cameras, GSS scheduled a series of live streams from various outdoor and indoor training locations, culminating with Pacquiao’s arrival at the MGM Grand Arena on fight night.